This home red air-knit gamer by Reebok was worn by Mikael Samuelsson during the 2007-08 Stanley Cup playoffs. The San Jose Sharks selected Samuelsson in the 5th round of the 1998 NHL Entry Draft. This Swedish native began his NHL career in 2000-01 after having spent time in the Swedish Elite League. Mikael spent one year in San Jose, parts of two more with the Rangers, a partial year with the Penguins and a season with the Florida Panthers before settling into a full time gig with the Detroit Red Wings in 2005-06. This winger spent 4 years in the Motor City and went to back-to-back Stanley Cup Finals in 2008 and 2009, walking away with the 2008 Stanley Cup. 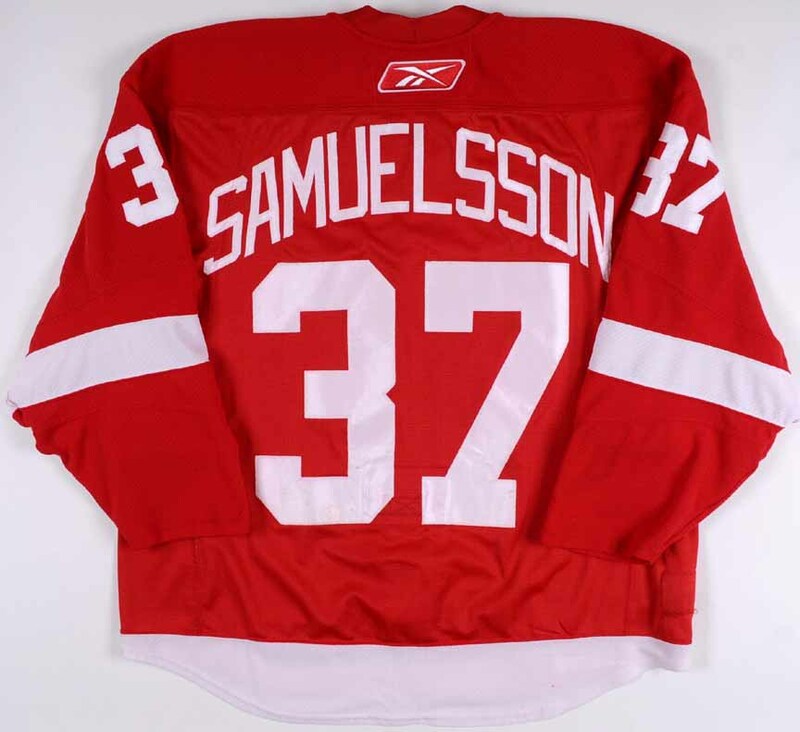 Samuelsson next spent a few seasons with the Vancouver Canucks before a partial year in Florida in 2011-12, which preceded a return to Detroit where Mikael last played in 2014. He is currently playing for Djurgardens IF in Sweden. 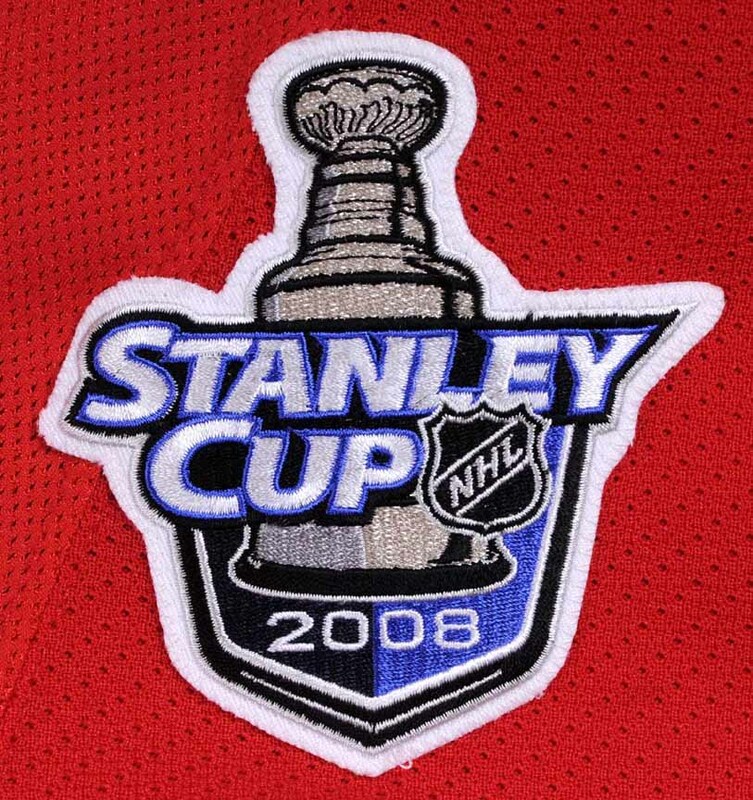 Sewn to the right breast of this gamer is the 2008 Stanley Cup Finals patch. The game wear on this playoff set 1 size 56 sweater consists of stick marks, board burns, board paint transfer and heavy inner pilling. Sewn to the inside hem is the official Detroit Red Wings game worn jersey and set tagging. A nice offering from the last Championship of the Yzerman Era in Hockeytown. This jersey will be accompanied by a Red Wings team letter.